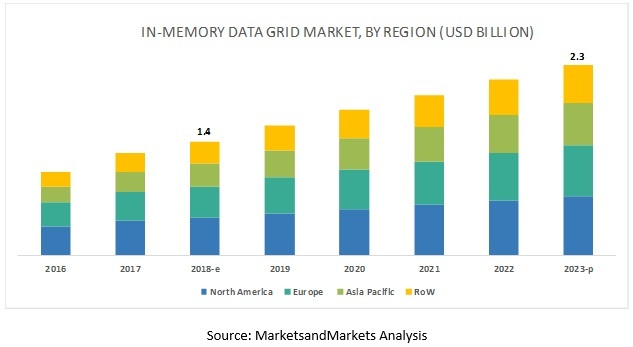 [132 Pages Report] The global In memory data grid market size to grow from USD 1.4 billion in 2018 to USD 2.3 billion by 2023, at a Compound Annual Growth Rate (CAGR) of 10.8% during 2018–2023. Major growth factors for the market include an increasing need for distributed architecture to enhance the limited storage capacity of the main memory and eliminating the need for relational data model and database. All aspects of business involve some form of transaction. Transactional applications, such as shopping and retailer apps, require high-performance data management. Various industry verticals have undertaken initiatives for digital transformation, and it has led to an increase in transactional applications. In-memory data grid aids transaction processing by providing high data consistency, thereby resulting in faster and smoother transactions. It can even support a large number of concurrent transactions that involve terabytes of operational data. In-memory data grid offers elastic scalability, as the number of transactions increase. It can boost the efficiency of payment processing that is crucial in areas of trading and online shopping apps. In the cloud deployment type, in-memory data grid solutions are deployed on public or private cloud located remotely. The cloud deployment type is expected to be the faster-growing deployment type in the in memory data grid market. Implementing the cloud-based IMGD solutions and services help SMEs (Small and Medium-sized Enterprises) and large enterprises focus on their core competencies rather than IT processes. Furthermore, it helps reduce the IT budget, as the tool only requires an internet connection. For organizations, which have limited budgets, the cloud-based in-memory data grid solutions are a good option because of its speed and scalability. The cloud-based deployment type also provides flexible service by offering data governance on demand, as customers have to pay according to their utilization of services. Growing digitalization are compelling financial organizations to build a lean, flexible, and efficient approach to cater to customers. Financial institutions deal with critical information, which, if not properly processed, can lead to severe financial and ethical implications. Hence, financial organizations across the globe are looking for in-memory data grid solutions, which can process data in real time and improve the performance of their business-critical applications. The BFSI vertical includes organizations that are into banking services, such as core banking, corporate, retail, investment; financial services that include payment gateways, stock broking, and mutual funds; and insurance services covering both life and non-life insurance. Trading systems with high transaction rates are examples of environments best-suited for the in-memory data grid. It enables financial applications with real-time analytics due to faster data access. North America is expected to hold the largest market size and dominate the managed services market by region from 2018 to 2023. The region has a high concentration of large multinational companies which largely contribute to the growth of the in memory data grid market. However, APAC is expected to provide lucrative opportunities for the in-memory data grid providers, owing to the increasing data volumes across industries and rise in adoption of the connected devices in the region. The increasing number of government regulations and compliances in various regions could affect the adoption of in-memory data grid. Major vendors offering in-memory data grid across the globe include IBM (US), Oracle (US), Red Hat (US), Software AG (Germany), Pivotal (US), Hitachi (Japan), Hazelcast (US), TIBCO (US), GridGain (US), ScaleOut Software (US), GigaSpaces (US), Alachisoft (US), and TmaxSoft (US). IBM, a leader in offering an extensive set of solutions under its in-memory data grid portfolio, caters to the needs of different verticals across the globe. The company’s leading in-memory data grid platform, WebSphere eXtreme Scale, is built on the elastic data caching technology for helping organizations improve the performance scalability and reliability of their business applications. The platform is deeply integrated with the WebSphere Application Server (WAS) and can perform data analysis and processing by reducing input/output operations in computer memory. Furthermore, IBM constantly focuses on growth strategies to enhance its offerings and expand its market reach with the help of strategic partnerships, mergers and acquisitions, business expansions, and product and service developments. In July 2017, IBM launched IBM Elastic Storage Server (ESS), a high-performance data and file management solution, for its enterprise clients. The solution is powered by IBM Spectrum Scale software, which has the capability to run complex business applications and support data processing engines, such as Hadoop and Spark. In March 2018, Oracle opened a new office in Texas, US. This expansion would enable the company to provide the necessary resources and training to cloud sales professionals and drive the growth of its cloud business. In May 2018, Red Hat partnered with IBM to target the hybrid cloud sector by integrating technologies and services. Following the partnership, IBM and Red Hat customers benefitted from the combined power of both the companies’ technologies deployed on private and public cloud. What are the major challenges faced by enterprises while deploying various in-memory data grid solutions? Where and to what extent organizations need in-memory data grid solutions? What are the challenges faced by in-memory data grid solutions providers while integrating innovative technologies with a client’s existing IT infrastructure? The study involved 4 major activities to estimate the current market size for in memory data grid market. Exhaustive secondary research was done to collect information on the market. The next step was to validate these findings, assumptions, and sizing with industry experts across the value chain using primary research. Both top-down and bottom-up approaches were employed to estimate the complete market size. Thereafter, the market breakup and data triangulation procedures were used to estimate the market size of the segments and subsegments of the market. In the secondary research process, various secondary sources, such as D&B Hoovers and Bloomberg BusinessWeek have been referred to for identifying and collecting information for this study. Secondary sources included annual reports, press releases and investor presentations of companies, whitepapers, certified publications and articles by recognized authors, gold standard and silver standard websites, regulatory bodies, trade directories, and databases. 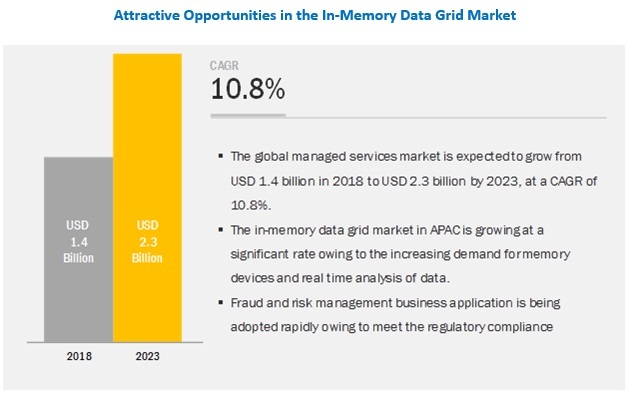 The in memory data grid market comprises several stakeholders, such as in-memory data grid providers, system integrators, technology partners, research organizations, resellers and distributors, enterprise users, and technology providers. The demand-side of the market consists of enterprises across industry verticals: BFSI, media and entertainment, consumer goods and retail, healthcare and life sciences, manufacturing, telecom and IT, transportation and logistics, travel and hospitality, and energy and utilities. The supply-side includes in-memory data grid providers offering in-memory data grid solution and services. Various primary sources from both the supply and demand sides of the market were interviewed to obtain qualitative and quantitative information. After arriving at the overall market size using the market size estimation processes as explained above, the market was split into several segments and subsegments. To complete the overall market engineering process and arrive at the exact statistics of each market segment and subsegment, the data triangulation and market breakup procedures were employed, wherever applicable. The data was triangulated by studying various factors and trends from demand and supply sides.